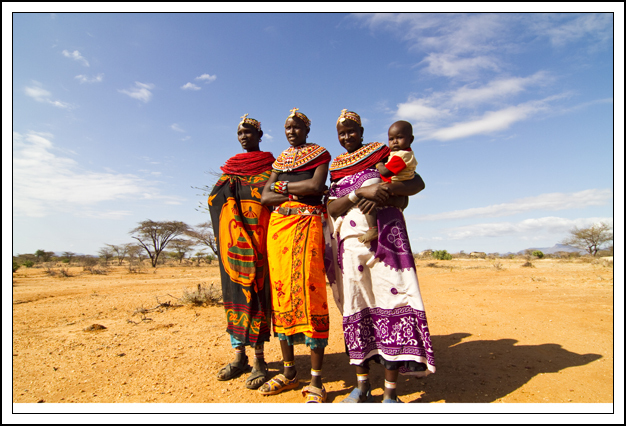 Elegant Samburu women and a child in Northern Kenya. Photos by David Lansing. 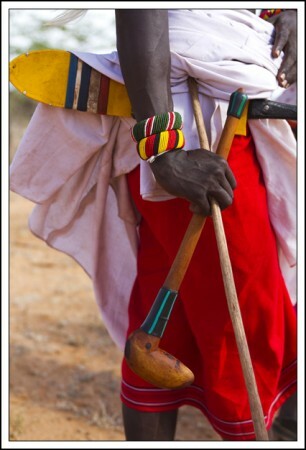 The Samburu warriors were so silent and serene while Pete was photographing them, neither shy nor cocky. Just present. And aware. Pete was moving quickly with these guys because they’re not going to stand there all day for you. They don’t mind letting you do your thing for three or four minutes, but then they’ve had enough and they move off and you can get their hackles up if you press them for more so you just take what you can get and say Asante sana—thank you very much. But while he was shooting the lmurran three stunning looking Samburu women wandered out from their nkaji to see what was going on. The three women were wearing colorful nkelas and were decked out with elaborate beaded necklaces. One wore an ocher-colored necklace that must have been made up of at least a hundred strands. They all sported beaded crosses in their hairbands and showed the golden rings in their ear lobs that indicated they were married. These three women could have been the wives of one elder or they could have been sisters-in-law, but whatever their relationship, you could tell they were very tight; if one moved a step to the left, the other two moved in the same direction. The Samburu warriors were getting bored and Pete had caught the approach of the women, who stayed at a discreet distance from both us and the men, out of the corner of his eye. He asked Calvin if the women would let him photograph them. Calvin said it wasn’t likely, particularly since one of the women had a young child with her. But he would ask. This is all very tricky. They are beautiful, dignified people. If they are going to allow you to photograph them, you want them to feel good about it and not like they’re being exploited. Two of the women seemed open to the idea of just a few photos, but the woman in the middle, who was also the most stunning looking of the three, had a bit of Henry Kissinger in her. The negotiations between Calvin and this woman became protracted. Who's shooting who? Photo by David Lansing. Meanwhile, I suggested to Pete that maybe one way to make them feel more at ease about the whole thing was for him to let them take his camera and shoot photos of us or their friends or whatever they wanted. So he went up to the woman who was giving Calvin a hard time and showed her how the camera work and handed it to her. She was magnificent. First she stuck the lens right in our faces, clicking off a dozen or more shots, one right after the other. Then she started taking photos of the two other women. 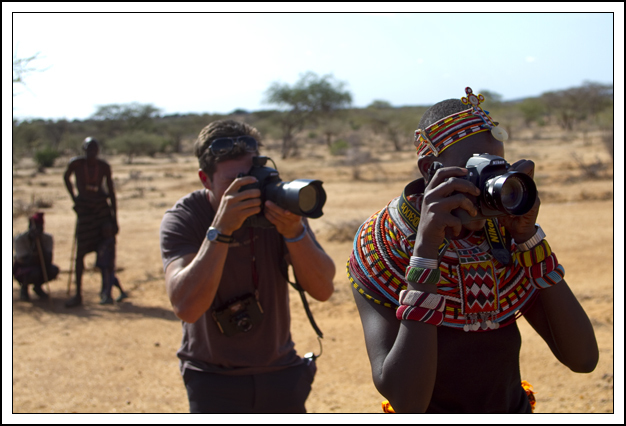 Followed by shots of our vehicle, our feet, the Samburu warriors (who just looked stunned over this whole thing). Then she turned around and started quickly hoofing it off to her village. Which is when Pete went running after her. Wanting to make sure that she didn’t think he was giving her his camera. She laughed when he came running up. I think she was punking him. But then she handed the camera back to Pete and three of them, looking as elegant as any New York models, lined up side by side and let Pete do his thing. Afterwards, of course, they all wanted to see the results on his little LCD screen. And, like all women, were critical of the shots, laughing at each other and making it clear to Pete that they didn’t like certain images and wanted them removed. God, what I wouldn’t have given to have had some sort of portable printer with me so that we could have given them some postcard-sized prints. That would have been priceless. Still, it was a very good afternoon. Here’s a little 30-second clip of Calvin negotiating with the women and Pete taking their photos. Samburu warriors looking good and just, you know, hangin'. Photos by David Lansing. So we’re driving through the bundu, having no specific destination in mind, just hoping we’ll come across a manyatta sooner or later, which seems quite likely since this is the only track out here in the bush and why would there be a road if there wasn’t a village somewhere along it. And then there, absolutely smack-dab in the middle of nowhere, are four or five Samburu warriors, called lmurran, just standing on the side of the road with their spears and pangas and rungus, those wicked head-knockers, looking like they’ve just been waiting for us. These guys know how to dress. A couple of them are wearing hot pink nkelas wrapped around their waist, perfectly complementing their patterned purple or green kikois, and they’ve got more bracelets and necklaces on than a movie star at the Oscars. Ivory plugs are stuck in their stretched ear lobs and they’ve got beads and bangles and cowrie shells and feathers stuck in their ocher-smeared hair. I mean, think about it. These guys aren’t going clubbing (well, maybe they are, but not in the way we think about it). They’re not dressed to go out on a date. This is just the way they look. Every day. Sharp. Stylish. Decked-out. Always carry your panga and rungu when you're out with the boys. Photo by David Lansing. They live in a hut made of mud and sticks called a nkaji which is no more than five feet in height and has no windows (though there is usually some sort of latticed affair to let out the smoke from the fire, which is built inside without a vent). The roofs are sealed with cow dung and covered either with hides (old-school) or gunny sacks (the modern improvement). They live on a sort of maize porridge called posho or ugali and a nasty mix of cow’s blood and milk that they ferment in a long gourd, called a nkarau, which is guaranteed to infest most Westerners with parasites that can take a good year to clear out of your gut (just ask my photographer, Pete McBride). Once in awhile—usually on a special occasion, like a birth or marriage—they’ll kill one of their prized cows or goats for a little meat. So, like I said, it’s not easy being Samburu. Still, if you’re going to be born a Samburu, you want to be a guy. Because their main job is to do what the four lmurran were doing when we came by: Stand around and look good. The women build the houses. The women collect the firewood. The women take the donkeys to go get water, cook the posho, cure the animal hides, care for the children, milk the cows, aid the birth of totos (animal and human alike), make cooking utensils, weave the ornaments, hollow out and smoke the gourds used to store food, and keep things tidy and clean around the village. The men take blood from the cattle (which are usually tended to by young boys). And slaughter a goat once in awhile. That’s about it. Did I mention that the men also have two or three wives? So they have to spend a lot of time, you know, servicing everybody. It’s exhausting. No wonder these guys looked pleased to see us when we came by. No doubt we gave them something to do for the day besides just stand around looking good. 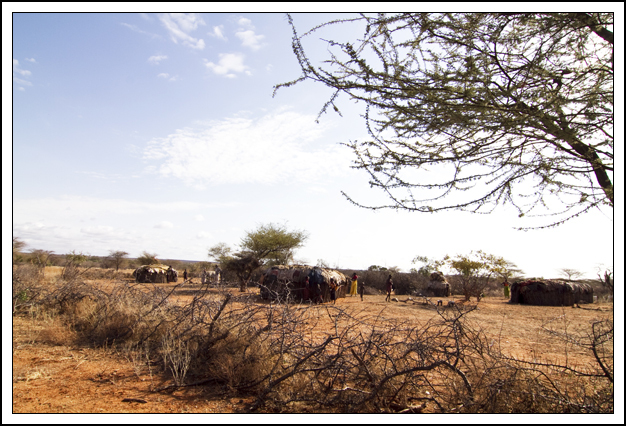 A Samburu manyatta off the Namunyak Conservancy land. Photos by David Lansing. A bit more controversy this afternoon with Piers, our host here at Sarara Camp. Calvin suggested at lunch that rather than going out looking for Grevy’s zebras or, god forbid, more birds, perhaps we should go check out a local manyatta, a manyatta being the Swahili word for the settlements the Samburu live in which usually consist of maybe five or six houses built in a rough circle surrounded by a thorn bush fence. That got everyone’s approval. Until Piers pulled Calvin off to the side and informed him that while it was perfectly fine with him if we went and visited a manyatta, there could be no photography. But, Calvin argued, the boys are here to do a story for National Geographic Traveler. What’s the point of visiting a manyatta if the photographer can’t do his job? 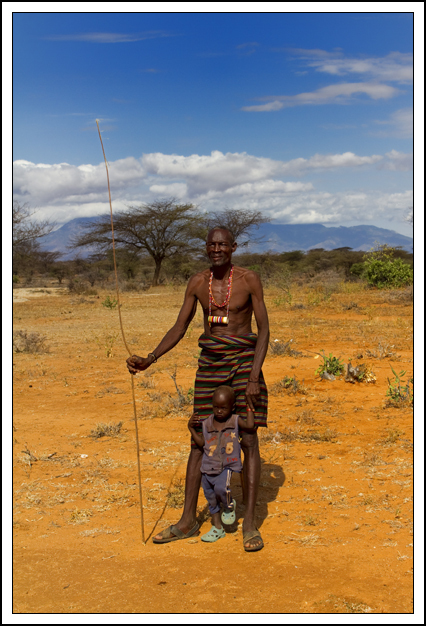 A Samburu mzee, or elder, with a toto. Photo by David Lansing. Sorry, said Piers. I’ve had the BBC here and all sorts of folks and absolutely nobody is allowed to visit a Samburu village within the conservancy and take photos. The problem, he told Calvin, is that if you take photos of the Samburu, they’ll want money and then you get into the whole thing of guests going through the villages and everyone has his hand out in supplication. They become beggars. On the one hand, it’s very hard to argue with Piers’ reasoning. Nobody wants to turn the Samburu, who are a very proud people, into bush beggars. But on the other hand, why is Mzee Piers deciding whether the Samburu at a manyatta should have their photo taken or not? It’s like he’s dad and the Samburu are his children. Which is exactly what Africans hate about mzungus—they’re always trying to tell the natives what they can and can’t do. Look, said Piers, you can go and visit the manyatta and you can take some of my Samburu staff with you and you can take their photograph at the village. 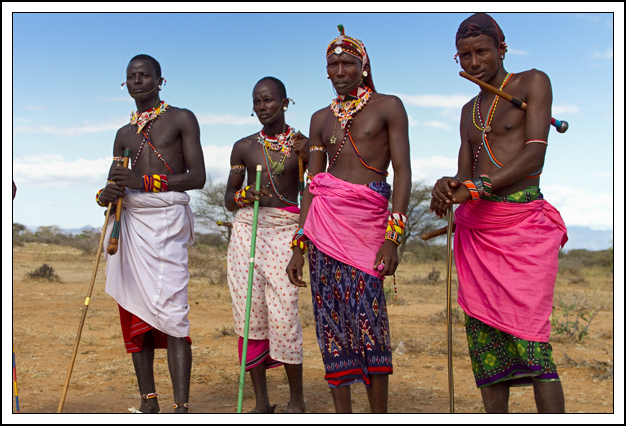 Just as long as none of the local Samburu are in the picture. Well, yes, and we could have gone to the zoo and taken a photo of an aardvark and I could have Photoshopped it into a background scene of the Mathews Range and said I’d seen another species of the Small Five (which I haven’t) but that would be no good—hapana m’uzuri. So in the end, we compromised. We promised Piers we would not go to a Namunyak manyatta and take pictures, and we didn’t. Instead, we went to a manyatta outside of Namunyak. And there we had a splendid afternoon. Taking lots of photos. 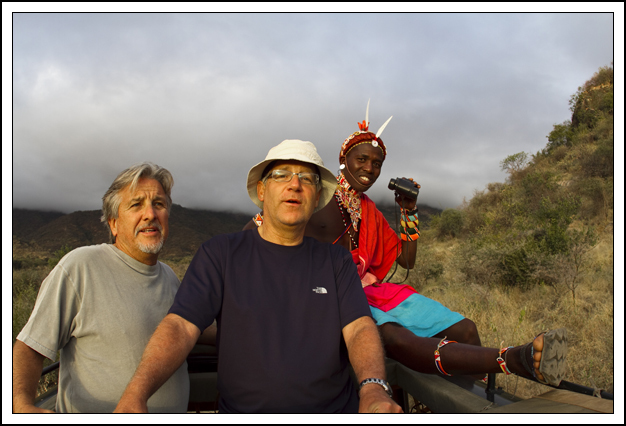 Fletcher, Hardy and our Samburu guide looking for birds at Sarara. Photos by David Lansing. Being so close to the equator, we get 12 hours of light and 12 hours of darkness at Sarara. Actually, that’s not perfectly true. Last night the sun set at 6:36 and this morning it came up at 6:28. So night is eight minutes longer this time of year. Mornings are the best here. I am awake even before I hear the soft shuffle of the mess tent waiter bringing us our tea. I lie in bed, watching the “hills where the child got lost” slowly brighten, listening to the bundu come alive, the unseen dudus chirping, clicking, humming, and always the soft, sad coo of the mourning dove. There are so many different birds living in these mountains. Calvin says probably 500 species or so. This morning when we went out game watching, ostensibly in search of some Grevy’s zebras, which I’ve yet to spot, we ended up spending most of our time staring at birds. In fact, I think Fletcher is turning into an ornithologist. He and our Samburu guide, Phillip, sat on top of the Land Cruiser studying an African bird book and giving out tidbits of information as we came across tawny eagles and pygmy falcons, starlings and weavers. “Wacha!” Phillip would yell to Reuben, our driver, and everyone would be thrown forward in their seat as the four-wheel-drive came to an abrupt halt because he’d spotted an ndege in a dead tree or scurrying through the bush or circling in the thermals. 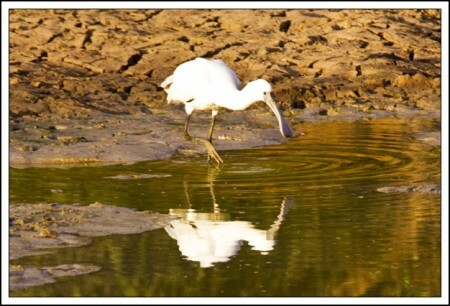 An African spoonbill hunting for breakfast. Photo by David Lansing. And then we’d sit there for hours—okay, not quite hours but for a long time—watching our spoonbill sweep the muddy waterhole with his pink and grey bill, just like the guidebook said it would. Eventually we’d move on. Until Phillip yelled “Tai!” again and pointed at a dead tree where a pair of goshawks were perched. We all looked up at the goshawks sitting on a favored perch, just like the guidebook said. It was uncanny. A pair of goshawks. Photo by David Lansing. We all searched the ground beneath the dead tree looking for lizards, insects, or small mammals. I would have looked for a passerine but I didn’t know what that was and I was afraid to ask Fletcher for fear we’d be here for another twenty minutes. “Wow,” said Fletcher. 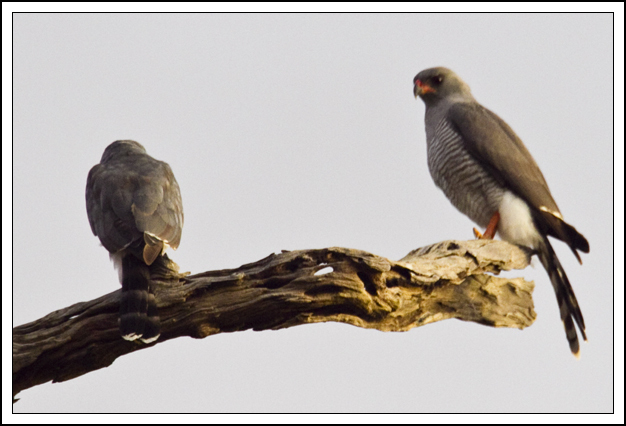 He and the Samburu guide studied the book together, looking at the photo of the goshawk in the book, then at the bird in the dead tree, back to the book. This went on for quite awhile. We saw a bateleur eagle and augur buzzards, sandgrouse and guinea fowl (both helmeted and vulturine) by the dozens, a harrier hawk, and lots of go-away birds. But no Grevy’s zebra. We just didn’t have time. “Maybe this afternoon,” said Phillip as we headed back to camp. Maybe. If we don’t have to stop to look at all of the birds. 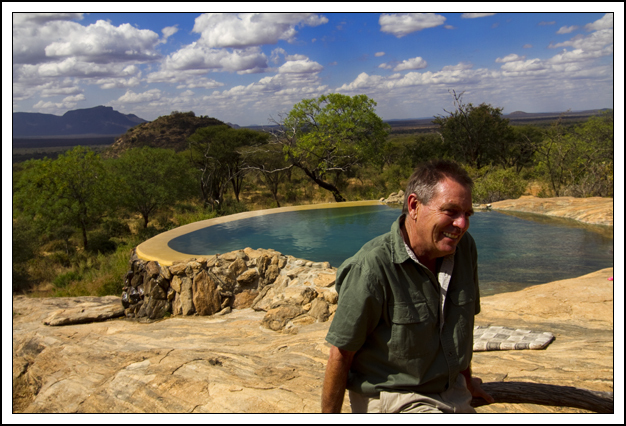 Ian Craig, the godfather of community conservancies in Northern Kenya. Photo by David Lansing. 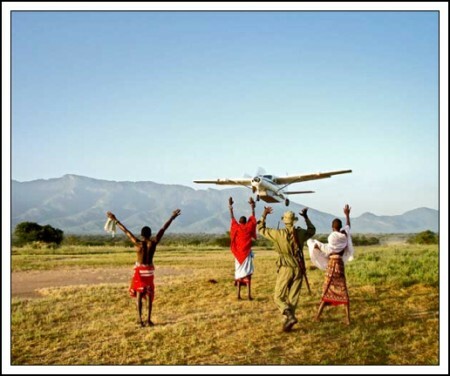 He means Ian Craig, the godfather of Kenyan community wildlife conservancies, who is flying in—from Nairobi? Or Lewa? I’m not quite sure—to have lunch with us today. Evidently the deal is that when a guest flies in, they buzz the camp to let them know they’re here and then a safari vehicle is sent to pick them up at the nearby airstrip. So we’ve just been buzzed. According to Tim, Piers (who runs Saraha and who I still haven’t met) will pick Ian up. So we busy ourselves by getting out our cameras and recording equipments and making sure everything works and is fully charged. And then Ian and Piers sweep in like Lawrence of Arabia and his boy entering the officer’s bar in Cairo after taking Aqaba from the Turks. I shuffle over to where Piers is standing, introduce myself, and tell him how much we’re enjoying our stay at Sarara and how very, very sorry I am that we didn’t get here in time to join him for lunch the other day. Piers nods, says nothing, and moves away. Well. I think that went particularly well. At lunch, I sit at the one end of the table, Piers at the other—like mom and dad. Between us is about ten feet and ten other people. Was it Piers idea to sit as far away from me as possible? Hard to say. Anyway, Ian Craig has decided to sit on my right so we can have a nice little conversation over the pasta salad and fresh fruit. Just to get things going, I mention to him, as I’m passing him the pasta bowl, that I understand that one of the reasons he started Sarara was because he’d seen a couple of elephants being slaughtered by shifta. Ah. Can you imagine? He’s camping not far from here and in the middle of the night shifta with AK47s mow down ten elephants, hack up their heads to get at the tusks, and flee leaving tons of bloodied elephant corpses behind them. That must have been nasty. He tells me that the Northern Rangelands Trust, which is the NGO that facilitates the development of community-led conservation initiatives in Northern Kenya, like Lewa and Sarara, would like to get something going up by Lake Paradise but haven’t been able to make anything work. He’s wondering if perhaps Calvin, after he takes us up there, might be interested in doing something similar to his camp in the Mara. Wouldn’t that be great? And then he excuses himself from the table, has a word or two with Calvin, and leaves hurriedly with Piers. Like T. E. Lawrence headed for Damascus, off to conquer more enemies in the desert.